Vomit pills! Make your friends puke! These vomit pills are incredible. Have you ever wanted to fake sick to get out of school or work? Have you ever wanted to do something diabolical, and spike a friends drink? 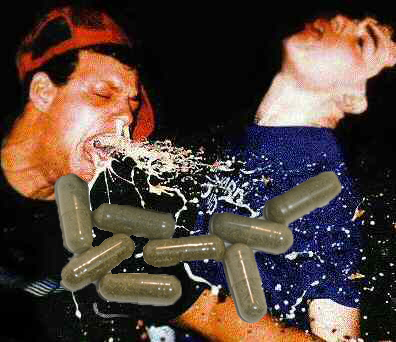 These puke capsules are a special blend of herbs and spices, they are all natural and safe and guaranteed to make anyone of any age or size spill their guts. The next time some douche cockblocks you at the club, drop one of these into his drink and walk away. In minutes you’ll be in hysterics and he’ll be out of commission, leaving just you and the girl of your dreams. These vomit pills make dreams a reality, every second of every day.